Advanced Imaging Society Japan Committee (AIS-J) is an industry organization established for the purpose of contributing to the steady growth of advanced imaging technologies, such as stereoscopic images, UHD (Ultra High Definition), VR (Virtual Reality), HDR (High Dynamic Range), and content creation through education, awards and research activities. 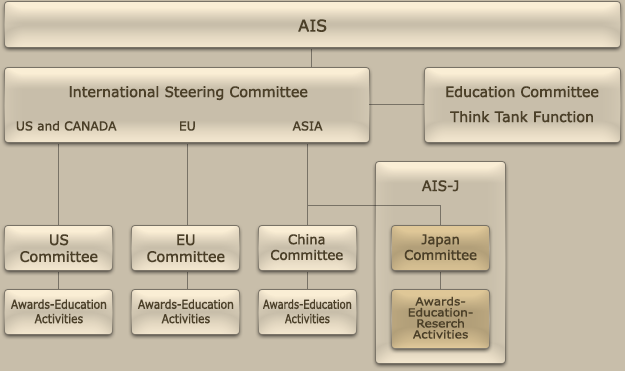 While working with AIS committees in the US, EU and Asia, the AIS-J aims to improve the art and technology of advanced image content and to support the development of related industry specialists through cooperation with related companies and organizations in Japan. I3DS (International 3D Society) was established in the US in 2009, and the name was changed to AIS (Advanced Imaging Society) in 2015. It now has a membership of over 400 companies and organizations involved in the art and technology of producing advanced image content. The society is actively engaged in various activities including education and awards for innovation of advanced image content and technology.